Queen Anne and Classical Revival styles. Large woman's college campus. Main Hall designed by Washington, D.C. architect William M. Poindexter as a picturesque yet unified Queen Anne-style brick composition adapted for the demands of collegiate institution. This building, know today as Main Hall, was erected over a 20-year period between 1991-1911. the central entrance tower and eastern wings were constructed between 1891 and 1893; two additional wings were added to the west in 1896. With the erection of the final wing to the west in 1899, the building was completed according to the original Poindexter plan. In 1911 an annex was added to the north of the entrance pavilion, and both East Hall (built in 1903), and West Hall (built in 1906) were connected to Main Hall by arcades. The huge structure appears as a large range of connecting building stretched along a ridge. It stands as the state's most ambitious and probably most successful example of the Queen Anne style of the late 19th century with its use of red brick, white trim, towers, turrets, classical detailing, and a multiplicity of window types closely relating it to contemporary Queen Anne-style academic buildings in Great Britain. Presser Hall: Georgian Revival. 2-story brick consisting of 3-bay central block with 5-bay wings. Center section has hipped roof and is topped by Baroque cupola. Door has elaborate limestone surround with engaged columns, broken arched pediment and central cartouche with date stones, and semi-circular transom. Windows have 12/12 sash with segmental arches, some are arched windows. Wings have wooden balustrade. Wall: Other. Brick walls runs along north side or Rivermont Avenue and continues on Norfolk Avenue and North Princeton. Wall has paneled sides and rounded top and is marked by brick piers. No special treatment is given the entrances to the college on Rivermont Avenue. Wall is approximately 4-feet high. 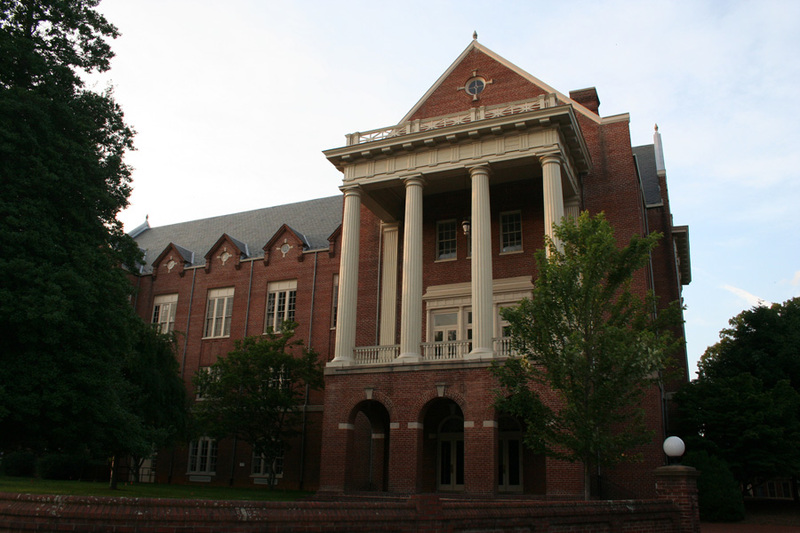 Smith Memorial Student Building: 3 to 3 1/2 story, T- or I-shaped brick academic building on a raised basement with classical and Old English design elements. The front and rear porches are supported by colossal columns set on bring piers. Four gable-roofed wall dormers on the front, rear, and gable ends of the building feature occuli. Oriel windows are located on the west end of the building. Other details include stone beltcourses and decorative brickwork. Main Hall (1891), Rivermont Av: The cnetral building of the college, facing the avenue, is the oldest on campus. It was designed by William M. Poindexter Smith Hall (1920-1923), corner of Rivermont and N. Princeton: Among the earliest buildings on the campus of Randolph-Macon Woman's College, the Smith Memorial Student Building was designed by the nationally-significant architect Ralph Adams Cram. Cram served as consulting architect to Stanhope Johnson of Lynchburg. The building was named in honor of William Waugh Smith, the first president of Randolph-Macon Woman's College. Presser Hall (1929-1930), Rivermont and Norfolk: Designed by Stanhope Johnson, this building was built with the financial support of the Presser Foundation. It is named in honor of musicologist Theodore Presser, who founded the influential music magazine The Etude in Lynchburg in 1883. The building's recital hall is known for its fine acoustics.